New essays by Eörs Szathmáry and James Griesemer on the biological and philosophical significance of Gánti’s work indicate its enduring theoretical significance, continuing relevance and heuristic power. New notes throughout the text bring this legacy into dialogue with current thought in biology and philosophy. Chemoton Theory vol 1: theoretical foundations of fluid machineries. Can you imagine a machine which may be divided into a thousand pieces—and each fragment still works as a whole machine? This is not possible with current human technology. But this is a natural possibility in the world of the fluid (chemical) automata, and it has been utilized by the living world for more than four billion years. Until now we could not design such automata, as the chemical (stoichiometrical) equations could not handle cyclic processes (including catalysts, enzymes). 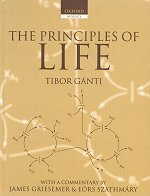 This century old problem is solved by cycle-stoichiometry, introduced in this book by Dr. Gánti. Cycle-stoichiometrical equation systems, operations between them, make possible the design and exact, quantitative description of fluid automata. This volume describes—besides the design methods of fluid automata—some of their industrial application. This lays the foundation of a new branch of science, the chemistry of reaction networks. Von Neuman proved the theoretical possibility of self-reproduction of automata, but human technology could not realize it. In chemistry self-reproduction is a natural possibility (autocatalytic processes). This volume describes, too, how to design automata, which are self-reproducing, more proliferate in space. Chemoton is the name of the simplest, program-directed, proliferating fluid automaton, as well as the name of the theory describing it. The second volume of this book proves that such systems behave as living entities, and that the base organization of all living beings is that of the chemoton organization. Chemoton Theory vol 2: theory of living systems.